In 1955 MV had a product in its line that few “real” motorcycle manufacturers would consider; the Ciclomotore, or Moped. Following WWII, the demand for dirt-cheap transportation was intens, and while micromotors clipped onto a bicycle met the intention of afordable, it wasn’t practical. Scores of moped builders appeared virtually overnight, but the most of the bigger bike makers shied away from the diminutive’s market. MV surprised its competitors by releasing the 48CC Ciclomotore, and its pressed-steel beam frame, two stroke engine and three-speed gearbox allowed it free reignover the hilly Italian countryside. 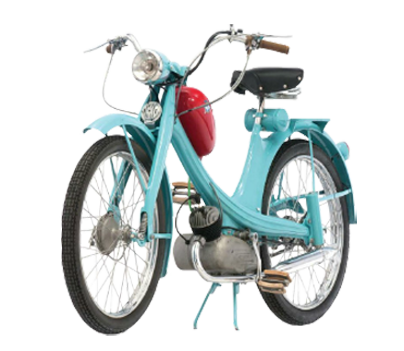 Granted, its 2 HP engine could coax only 50 km/h from the 42kg bike but a price of just 79.000 Lire ($127) virtually anyone could afford to be on wheels. mi, felis libero ut at commodo in dictum tristique pulvinar porta.